Jimmy Hall will be part of a Southern rock cruise to Mexico in January along with Kentucky Headhunters, Blackberry Smoke and Lynyrd Skynyrd. Baby boomers who were teens in the 1970s will recognize Jimmy Hall as the frontman for Southern rock band Wet Willie. His vocals and stage swagger helped propel Wet Willie to the top of the Billboard charts with hits such as "Keep On Smilin,'" "Street Corner Serenade" and "Weekend." Riding on the success of Wet Willie, Hall went on to a solo career, then collaborating with other artists. His band might have slowed down its pace, but Hall didn't. In fact, he still tours, and on Friday night, Dec. 28, the singer/saxophonist will stop in Songbirds for a 7 p.m. show. "I've presented Jimmy Hall numerous times over the years," says Mike Dougher, Songbirds entertainment coordinator. "He used to come in the Monday after Christmas to The Sandbar. It was always such a fun atmosphere between his music and folks in that holiday spirit. That's one of the reasons we chose the Friday after Christmas this year. He plays all the Wet Willie hit songs and the whole show is just a blues and rock celebration. Add to the mix Kenny Greenberg on guitar (2012 Guitarist of the Year) and you've got one heck of a night." A big factor in Hall's 44-year career has been his instinct for good collaborations. One has been with Jeff Beck. They first worked together in 1985 on Beck's "Flash" album, then reunited for a tour in Japan in 2005, and have worked together off and on since. 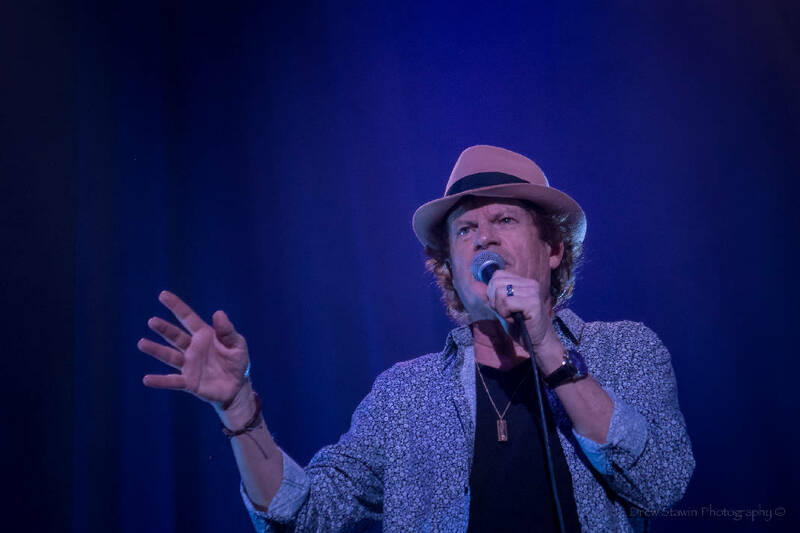 Hall was included on Beck's 2017 DVD/album release "Live At the Hollywood Bowl." This year, the pair reunited for a world tour with 50 dates across Europe and the US. "The Stars Align tour was June through August, the first six weeks in Europe with Jeff Beck. Then we started on the West Coast of the United States on July 15 and moved eastward," Hall described in a phone interview. "It's a challenge for me to jump up there with Jeff Beck. That's the hardest I think I've ever rocked." And, yes, Hall says European audiences not only know his connection with Wet Willie, they sing along. Southern rock evidently has no language barrier. "The thing about European audiences is that they are very sophisticated fans of American rock, blues and soul. There are a lot of Wet Willie fans over there and in Asia. I've been to Japan five times with Jeff. It's amazing to see just how much they pay attention and how much they like American music," Hall says. He's amused to find that now it's not only baby boomers filling his audiences, but their kids as well. "I see a lot of boomers, the guys and girls who grew up listening to Wet Willie. Then there is another generation that is into jam bands, the Allman Brothers and Southern rock. Their parents turned them on to it." That age span is likely to fill Songbirds on Friday night when Hall says he, Kenny Greenberg and friends will play Wet Willie hits as well as songs that Prisoners of Love played, the band he and Greenberg had in the mid-'80s. "We've got a set ready and it covers a lot of ground," he describes. "But inevitably, there is always a song someone says they want to hear. If someone has a suggestion, and we can pull it off, we'll do it."